Our company knows that searching online for construction container rental options can be exasperating. The team at Discount Dumpster understands your trouble. As such, you have uncovered your one stop shop for your container rental needs in the Chicago area. We have been in the business for over a decade, and we are confident enough to say that our construction container rentals are better than any of the competition. Call our team today to see the Discount Dumpster difference! As a customer, you are welcome to continue searching for better rental options. As a company, we are certain you will return if pricing and service is your bottom line. Many of our customers are reoccurring customers. They continue to do business with our company because they know we offer the best rates and services in the immediate area. Call us today. Our customer service representatives are available Monday through Friday. The 10 yard construction container is standard for small home improvement designs. The bin is small sized and can fit virtually anywhere. You can dispose of small amounts of household and construction rubbish such as wood and trash. Slightly larger than our 10 yard, our 15 yard is great for small renovations and cleanups. The container can hold light demolition materials such as sheet rock and metal. Likewise, the low height of the construction container makes scrapping easy for the customer. Our 20 yard construction container is common for customers with large-scale roofing and refurbishing plans. With the same height as our 10 and 15 yard, our 20 yard container makes for easy disposal of household rubbish and light construction debris. The container can also be used for small-scale demolitions. Smaller than our 40 yard, our 30 yard construction container is typical for customers with multiple remodels. The container can easily hold construction and demolition litter. As such, the container is fitting for large-scale clean outs of buildings. The 40 yard container is great for customers with full large building retrofitting. The bin allows for the riddance of several tons of debris at once. As the largest container, it is ideal for contractors with large-scale plans. When we ask our customers why they decided to choose Discount Dumpster, they give us their feedback. One reason customers choose to come back is our low, straightforward pricing. There are never any hidden fees, and what you see is what you pay! Another reason customers reoccur is because of our clear rental terms. Lastly, customers choose to come back because they love our dedicated customer service team. We make sure we are available to our customers from delivery to pickup. Our team believes that communication is integral to maintaining a positive rapport with our customers. Call today to get started! It doesn’t matter whether you are renovating a bathroom or gutting an entire apartment building, Discount Dumpster is here to assist with your disposal needs. We are confident we have ideal construction container for you! 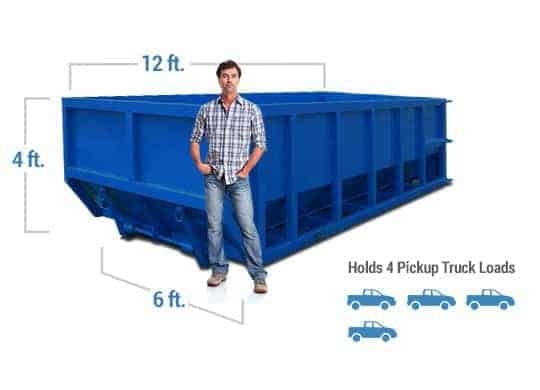 Our company offers a variety of bin sizes ranging from 10 cubic yards to 40 cubic yards. So no matter what size your refurbishing plans may be, Discount Dumpster has the container you need at a rate that can’t be beat! Our construction containers are built to accommodate most types of refuse. The bins can confidently hold everything from basement rubbish to broken mirrors to bricks and wood. As such we are convinced our containers will keep your work site cleanup neat. Call our team Monday through Friday to see which option would be the perfect fit for your needs!